Orthodontic treatment is an investment, and your dental retainer is key to maintaining the results of your hard work and patience. At Rogers & Andrews Orthodontics, we are passionate about giving our clients world-class smiles and the ability to keep them for years to come. Here are some basic tips for taking care of your retainer (so it can take care of you). Brush your teeth before inserting your retainer and clean your retainer by brushing it as well. When you are not wearing your retainer, be sure to put it back in the case. Since your retainer is made of plastic and could melt, never leave it in the sun or near anything hot. Do not wrap your retainer in a napkin since it could be thrown away accidentally. In addition, keep your retainer away from household pets, they are attracted to the scent of saliva and many have been chewed by dogs. If you lose or break your retainer, you aren’t alone. We are here to help. At Rogers & Andrews Orthodontics, there is a replacement fee for each retainer that covers your office visit and the retainer materials since they are custom-made in our lab. Please bring your retainer to each check-up at our office. If you are having problems with your teeth or retainer, please let us know before your retainer checkup. Since all studies show that teeth shift as we age, please wear your retainer for years to keep your beautiful smile. Maintenance of incisor alignment is a significant problem, even for well-treated cases with patients at risk being difficult to predict. The relapse occurs due to the gum fibers pulling the teeth toward their “old crooked positions” because of the natural narrowing of the dental arches as we age and because of growth. 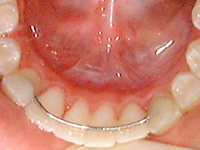 The bonded lower retainer is a proven method to minimize relapse. 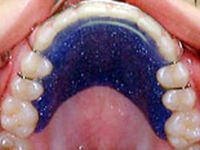 The University of Washington Group studied changes of incisor irregularity 10 to 20 years post-retention and concluded that the majority of the relapse occurs during the first 10 years; and for this reason, it is best to retain with a semi-permanent retainer during the teen years and early 20’s. 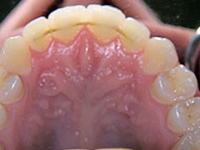 We advocate leaving the 3×3 retainer for a lifetime if oral hygiene is adequate. 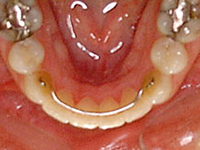 This 3x3 Retainer Has Been In Place 22 Years. 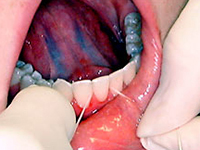 Jon Artun and the University of Washington Group also report that there is no risk of gingivitis or caries associated with long-term use provided that the lingual bonding is trimmed to avoid impingement and undercuts. Completely Adjusted 3x3 Wire. 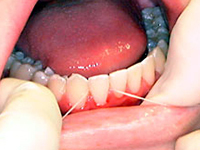 A lingual retainer that is bonded only to the cuspids can be flossed by placing the dental floss on each side of the lower incisor and working the floss toward the gum. The patient also needs to spend extra time brushing the back of the lower incisors. 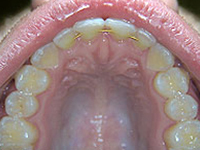 Upper bonded wires are recommended in cases where the upper incisors were severely rotated or if there were large spaces between the upper teeth. Upper bonded wires are placed to help prevent relapse, and they should be maintained for a lifetime if oral hygiene is adequate.